Officially announced by Samsung back in June, the Galaxy Tab E slate is now available to buy in the US via Verizon Wireless. The largest North America carrier is selling the new tablet for $329.99 off contract, $129.99 with a 2-year contract, or $13.74 per month for 24 months (price available only to qualified customers). Unlike the Samsung Galaxy Tab S2, which was released last month in the US, the Galaxy Tab E is not a high-end device. It's presented by Verizon as a "family tablet", thanks to the fact that it runs Android 5.1.1 Lollipop, and comes with a Muti User Mode that allows family members to set up individual profiles. Shortcuts to Netflix and Hulu are also included. 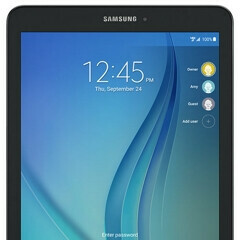 The new Galaxy Tab sports a 9.6-inch display with 800 x 1280 pixels, and is powered by a quad-core processor of unknown provenience. Other features include a 2 MP front-facing camera, a 5 MP rear camera, 1.5 GB of RAM, 16 GB of storage space, microSD card support, and a 7300 mAh battery. Verizon' Galaxy Tab E is compatible with the carrier's XLTE network, and can be purchased starting today, both online, and in retail stores. Any takers? $329.99 lol Verizon really think people are stupid. That's the retail price, sir. But I do share your opinion about the price, it's $150 more than it should be, given the specs. That's the retail price from Samsung, stupid. Hello. I have a Samsung Galaxy Tab 9.6 Wi-Fi (SM-T560) which is still in Android 4.4.4 KitKat although an intermediary tablet released 2015, June (with Lollipop already rolling) and had another member of the cast line in January 2016, the Galaxy Tab and 8.0 (SM-T375 (Wi-Fi) and SM-T377 (4G)) already with the Android 5.1.1 Lollipop. My model even is expected to upgrade to another version of Android, indicating that eleficará stuck in the current version (as many devices from Samsung, as usual) The last bug fix and optimization update was in November 2015 and was second only to update it (remembering that the Galaxy Pocket 2 received 9 patch updates and remained stuck in 4.4.2). It is about a problem that will portray here in the forum. I do not know if it is widespread or just my unit being affected, but the tablet when you leave it on the battery until it behaves well. However, when we settle off the device, if by chance the tablet is 60% or less of battery and it is a few hours off, when I decide to turn it back on here is the surprise: The tablet does not start. Assuming that is the battery, put the socket and what do I find? The battery was zeroed, empty. That's right, it drains off the same battery. They are 5000mAh and more than half fades soon be connected to each percent falls at an acceptable pace. I do not know whether it is hardware failure (well, me I never let him suffer a fall, but how to acquire third-party can not ensure that it has not been dropped some time and this may be causing this disorder, but seeing the tablet with a looks great, it is hard to believe that it has already been dropped) or software failure. I prefer to believe the latter. What do you say?